We were in a thankful, restful, and celebratory mood today; today marks the one year anniversary of our baby's conception! We enjoyed visiting Duke Gardens in the lovely weather we are having, and to see the many beautiful spring blooms. I prepared Field Roast Grain Meat's handmade stuffed (with apples, squash, and mushrooms) Celebration Roast - it just needs to be heated (at 350°F for a few minutes), which I did in my toaster oven. I prepared some mashed potatoes with finely chopped shallot, as well as rosemary leaves, salt, olive oil, and vegan Parm! "Parmesan cheese". Road's End Organics, an all-vegan company that makes a line of vegan macaroni and "chreese", also makes gravies, including a savory herb mix, that I used. We purchase soups each week from a woman named Melissa. This week she made a Spanish Vegetable Soup with White Beans and Spinach, and I heated that to accompany our meal. Today, I wondered how my rice cooker would do if I tried including lentils with rice. In my experiment, I put in 1 cup brown rice, 1/2 cup red lentils, 2 1/2 cups water, a vegan bouillon cube, six cardamom pods (first pressed so they were broken), a pinch of turmeric, and a few pinches of ground roasted cumin, then let the rice cooker go on the brown rice setting; the cooker took 1 hour 25 minutes. 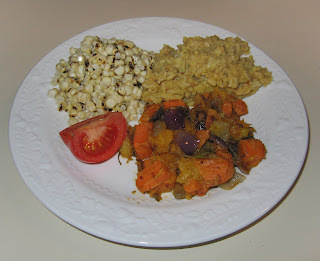 While the rice was cooking, I cut half of a red onion into large chunks, maybe 3/4" square, and started sauteeing them over medium-high heat just a minute or two, then added a ten ounce bag of frozen cubed butternut squash and about half of a ten ounce bag of frozen cubed sweet potato. I reduced the heat to medium, covered the pan, and let it cook for about 4 minutes. I then uncovered the pan, stirred and flipped the squash and potato, and covered again, cooking for another 5 minutes or so. I also served corn, roasted over an open flame, then stripped and mixed with Earth Balance margarine, salt, and fresh lemon juice. Dinner turned out well! The rice was quite interesting; I've never had such firm rice that stuck together, like a porridge. It worked, but were I to do it again, I would add 3 or 3 1/4 cups of water instead of 2 1/2 cups. Yesterday was the opening night of an exhibit of Now I Lay Me Down to Sleep photography! I am a proud participating professional photographer, and was touched to have several of my images exhibited, including parents of a child I had photographed. After the exhibit, we went out to eat pizza. My father-in-law noticed pretty radicchio when he was shopping with my wife a few days back, and after calling me to ask about it, they picked up two heads. Of course, it is a rather bitter leafy vegetable, and I've only really eaten it as small pieces within a salad mix. I've found some recipes for cooked radicchio, which I'm likely to try. For today, I was really struck by the beauty of the intact leaves. To cut the bitterness, I sprinkled some lemon juice on the bare leaves, and also plunked down a dollop of guacamole, as well as a briefly boiled broccoli crown. I recently picked up an interesting pasta made with radicchio called Bigoli Nobili, a special Venetian pasta dating back to the year 1400. I cooked it and then mixed in some olive oil, roasted tomatoes, and red onion. It was good and had a subtle flavor of radicchio. 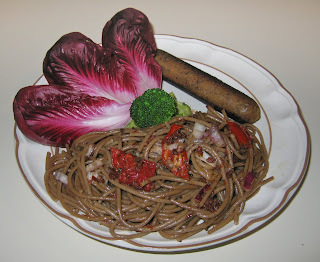 A grilled vegan Field Roast Grain Meat Company apple-sage artisanal vegan sausage completed the meal. My usual Thursday night photography series is now Wednesday night for this six-week session. Last night, a student and his wife joined us for a southwestern meal at Margaret's Cantina, where I enjoyed three enchiladas - one with spinach, one with tempeh, and one with a vegetable mixture. My father-in-law saw me starting to work with Brussels sprouts today, and said that he had tried this, to him, unfamiliar vegetable recently at the Whole Foods hot bar and did not like it. He at first cautioned me to go light with it, but then kindly said that if I were preparing it, it was going to come out well! I didn't betray that too-generous trust, and was delighted that he enjoyed the meal that I created. I cut some Russian fingerling potatoes into approximately 3/4" chunks and started sauteeing them. 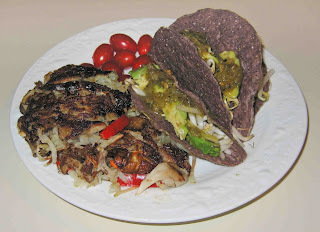 A few minutes later, as the potatoes were getting cooked, I added about a third of a medium red onion, cut into thin half-moons, as well as a medium jalapeno pepper, sliced into 1/4" thicknesses. A minute later, I added about a half dozen Brussels sprouts, cut into halves or, for bigger ones, thirds. 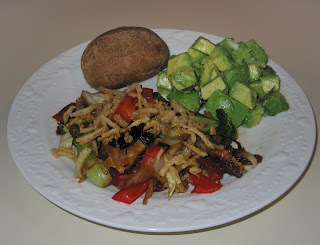 I let this assemblage cook for about five more minutes till the potatoes started browning. I added a little salt, a pinch or two of turmeric, about as much cumin seeds, and a pinch of red chili powder. I continued the saute for a half minute or so to let the cumin toast a bit, then added about an eighth of a cup of water to soften the potatoes and let the turmeric set into the vegetables. For Saturday's potluck, my wife had made some lentils, and we had a lot leftover. 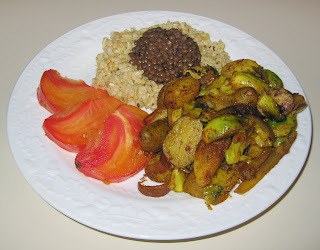 I heated the lentils and served them over some brown rice that I had cooked with a vegan bouillon cube. Heirloom tomato completed the meal, which turned out well. Tomorrow we won't be eating at home; I have a new set of six photography classes starting. This class is normally on Thursdays, but I am trying Wednesdays to catch folks who perhaps want to take the class but can't make Thursday evening. For tonight's meal, I told my father-in-law, visiting us for a few months to help take care of our cute little baby, that I had a surprise. I put a spaghetti squash to boil and cooked it till a knife cut showed that it was soft inside. I removed the squash from the water, halved it and took out the seeds, then asked him to watch as I ran a fork down the flesh - generating "spaghetti"! I had some chunky tomato sauce leftover from last week, and served it atop the squash, along with vegan Parm! "Parmesan cheese". 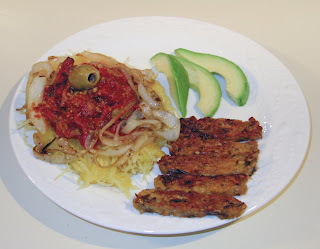 Sauteed tempeh (except for my father-in-law, to whom I introduced baked tofu) and avocado rounded out the meal. Not bad for having to quickly put dinner together after shopping and working out! Yesterday, some friends kindly invited us to their home. They made a very nice South Indian meal of sambar, idli, and fruits; we brought coconut milk-based chocolate covered "ice cream" bars. 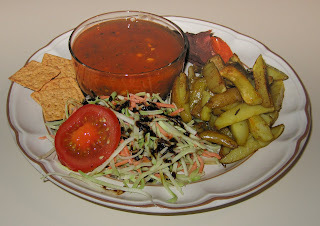 We had a nice vegetarian society potluck dinner and discussion of stress reduction techniques on Saturday. My wife made some lentils and I simply brought a brown and wild rice mixture. Tonight, I sliced two Field Roast Grain Meat Company's apple-sage artisanal vegan sausage into pieces between 1/4" and 1/2" thick, then quartered the pieces. I started sauteeing the sausage over medium-high heat for a few minutes till it started just browning, then I added a carefully cleaned sliced leek. 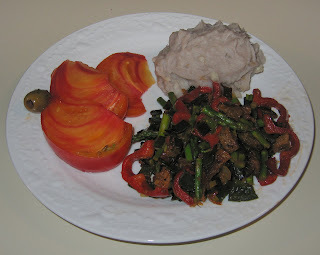 A few minutes later, I added both poblano pepper and sweet red bell pepper, as well as asparagus. I served with a little bit of salt, along with mashed potatoes. Yesterday was the last of one of my six week series of photography classes (next week a new series begins - this time on Wednesday instead of Thursday nights). We went out to one of our favorite local restaurants, Cafe Trilussa. I enjoy talking with Giovanni, the owner-chef of this lovely, small restaurant. 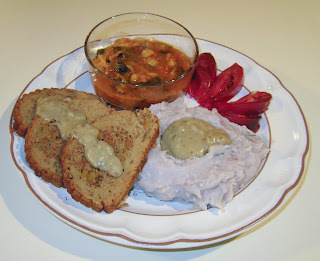 As usual, we asked him to serve us family-style pretty much anything he wants that is vegan, and he brought out quite a few dishes, including risotto, a curried dish, caponata, whole wheat pasta with pesto, and several other ones. The day before that, my friend Linda Long was in town on a book tour of her new book Great Chefs Cook Vegan (for which I had helped test some recipes). We went to a bookstore talk in Raleigh, and that provided the perfect opportunity to finally take my wife to a good restaurant I've been wanting to introduce her to, Irregardless, run by the longest running area chef, Arthur Gordon and where I organized for Triangle Vegetarian Society two Thanksgivings, in 1997 and 1998. My wife, father-in-law, and I (and baby, I guess, indirectly!) loved the meal. We shared a grilled peach-spinach salad; pirogi, curried cauliflower, and Pad Thai main courses; and a very nice fruit crisp. I love that they label items that are vegan as such. When I was preparing artichokes for steaming yesterday, I cut the stems into small pieces and tossed them into a slow cooker, along with a variety of vegetables like summer squash and carrots, as well as some grains of wheat, a vegan bouillon cube, and water. It served as my wife and father-in-law's lunch. There was enough leftover that I heated it up with some red wine and served that as a side dish. 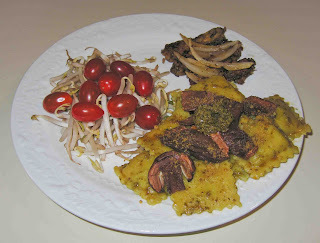 For the main dish, I sauteed a diced small red onion for a few minutes till the pieces started turning clear, then added about a third of a package of tempeh, cut into small cubes. After five or so minutes, as the tempeh started to brown a bit, I added four or five large clumps of oyster mushrooms, roughly hand cut into half stems. After a few minutes, I added some salt and a bit of Jamaican jerk sauce, as well as a dash or two of tarragon; I would have also added a splash of wine (goes great with mushrooms! ), but I skipped that since there was wine in the soup. 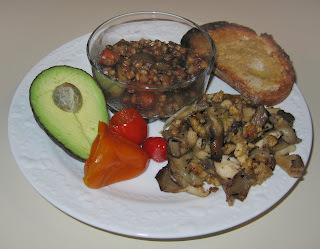 I served as well some whole wheat bread toast, avocado, and sweet pickled peppers. All enjoyed the meal! I have been looking forward to serving a steamed artichoke to my father-in-law and when I found artichokes at a reasonable price, I purchased three. 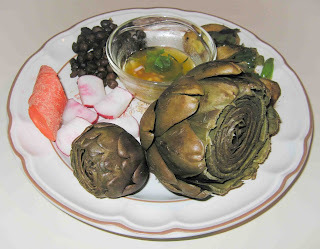 I steamed the artichoke for about 45 or 50 minutes, and steamed beans and Brussels sprouts for about 20 minutes. I also heated some smoky tempeh strips. I prepared a dip for the artichokes (and the steamed vegetables) by simply melting Earth Balance margarine and mixing in salt, rosemary, and lemon juice. It was a good dinner! This past weekend, we took our baby on her first vacation. We left on Friday, had dinner at Tower South Indian Restaurant, and ended up at the beach, where we like to rent an ocean-front condo. We brought food from Tower to cover our dinner on Saturday. On Sunday, we ate for the first time at a kosher Moroccan restaurant, Nagila (we actually restaurant hopped and first ate salad at Tidal Creek Coop, which features an all-organic salad bar, an all-organic produce section, and great smoothies) - everything was great! They made very nice falafel, excellent eggplant, and a nice rice-stuffed cabbage. The food was so good that my father-in-law has said it is his favorite food we have taken him out to eat. I love Vicolo Pizza organic cornmeal crust pizza shells, and it was about time to make pizza for my father-in-law visiting from India. I made a thick sauce with two kinds of marina sauces and tomato paste, and mixed in sauteed zucchini and onion. 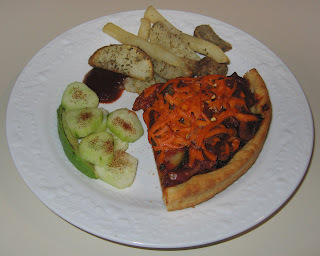 On top of one pizza, I also added some shredded Follow Your Heart brand cheddar style vegan cheese (it's good, but I wish that my favorite, Scottish Sheese, were more readily available in the States outside of mail order). I recently purchased some Rusticella d'Abruzzo artisinal pasta from Italy. They have a variety of products, including a thick pappardelle (broad fettucine) rigate. 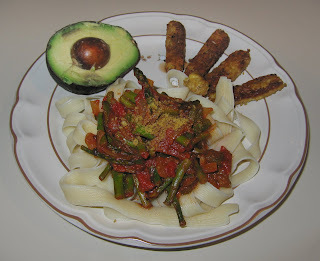 I made a simple sauce out of sauteed asparagus and marina sauce, and also served some sauteed tempeh and avocado. It was a good dinner! Today was the second day of the annual Professional Photographers of North Carolina convention; I wasn't interested in the afternoon talk, so came home after enjoying the trade show. I had recently purchased Belgian endives, thinking to try incorporating it into risotto. 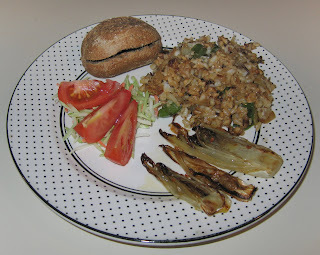 I still may do it, but tonight tried slicing two endives lengthwise into 4 or 5 pieces. I then put them in an ovenproof plate, put a little bit of olive oil and salt over the top, the broiled them in my toaster oven. I had thought the endives would brown fairly quickly, but at least in my toaster oven, it took over five minutes (be careful when broiling; I encourage folks to keep a careful eye every minute or two, depending on your oven's performance). I then flipped the endives and put a little bit more oil on the new tops, and broiled again for about five minutes. Domino's Pizza apparently makes vegan garlic and marinara dipping sauces, and I had a tiny container of garlic dipping sauce. 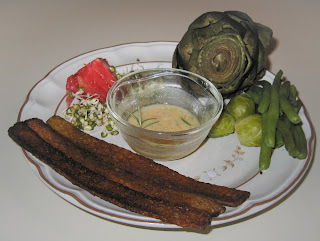 I mixed about half into the endives and served each endive piece with a drop or two of ume plum vinegar. It came out suprisingly good; I was afraid it might be too bitter, but it wasn't. Yeah! I also heated leftover brown rice that my wife had prepared this afternoon and made a simple saute with tempeh, onion, and bell pepper. I mixed the finished saute into the rice, along with a bit of soy sauce. It was a good dinner! I look forward each year to the annual convention of the Professional Photographers of North Carolina. This year it came a little early and started today. I am not an early person, but brace myself and wake up to get to sessions that sometimes begin as early as 7a or 7:30a! Today was a short day and I was done by 4:30. We had planned on going to a potluck dinner, but ended up last minute not going. I put a reasonable dinner together fairly quickly. My wife's father, visiting us for a few months from India, cut some fingerling potatoes into strips; my wife was planning on our taking a potato dish. I used the potatoes by mixing in a little olive oil, salt, and rosemary needles, then baking, single layer, in a preheated 425°F oven for about a half hour. We buy soup locally from a woman named Melissa; her soups are always excellent, and I served some of her current batch (a chickpea soup) as well. Finally, I served some broccoli slaw (shredded broccoli stalk and carrot that I had purcased as this raw mix) with Jamaican Pickapeppa sauce drops. Not bad for an unplanned dinner!